This paper from the Better Care Network examines the mismatch between children’s needs and the reality of their situation and long-term effects of residential institutions, with particular attention to lower income countries. 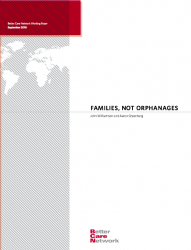 Evidence presented in this paper indicates that the number of orphanages is increasing, particularly in countries impacted by conflict, displacement, HIV/AIDS, high poverty rates or a combination of these factors. The paper examines available evidence on the reasons why children end up in institutions and the consequences and costs of providing this type of care compared to other options. The paper concludes with a description of better care alternatives and recommendations for policy-makers.